Rows. This collections contains all data rows that belong to RadGridView. Data operations such as grouping, sorting, filtering, etc. 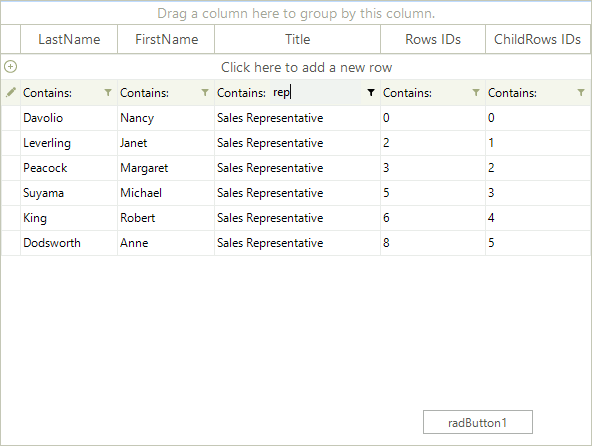 do not change the content of the collection or the order in which the row objects exist in the collection. ChildRows. 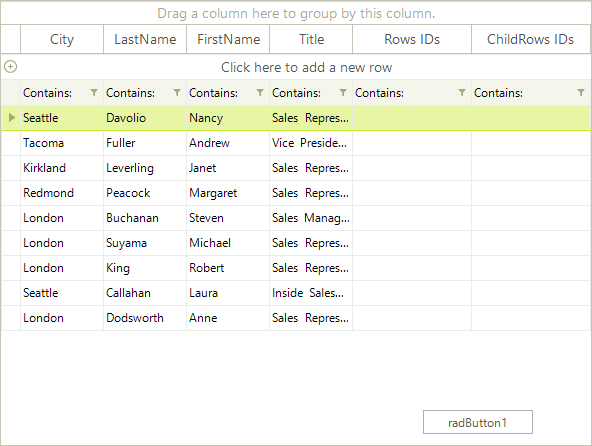 This collection returns the data rows that are currently represented by RadGridView in the order in which they appear. The collection is modified every time a data operation (grouping, sorting, filtering) occurs. Depending on the data operation applied, this collection may contain 'system' rows, i.e. 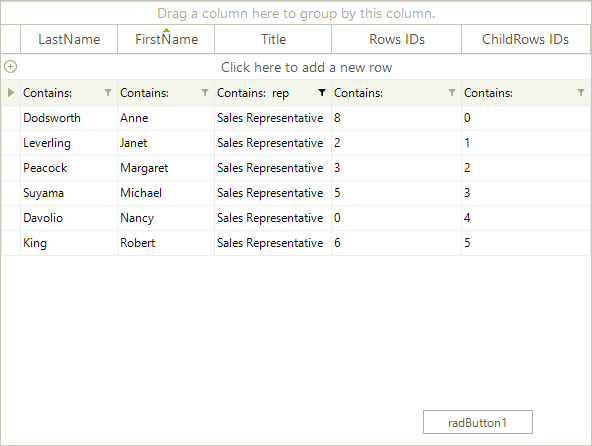 grouping rows, that are not a part of the original set of data rows contained in the Rows collection. For a better understanding of the difference between Rows and ChildRows, let's analyze the following example. Let's start with a RadGridView bound to the Employees data table of the well-known Northwind data base. We will add two columns - one that will represent the indices of the rows in the context of the Rows collection and one that will represent the indices of the rows in the context of the ChildRows collection. Then, we will execute some data operations on the RadGridView instance to demonstrate how this reflects on the ChildRows collection. As you can see in the screenshot above, in a grid with no data operations applied, the indices of the rows in the context of the Rows and the indices of the rows in the context of the ChildRows match. 3. Let's now filter RadGridView. For example, let's type 'rep' in the Title column. 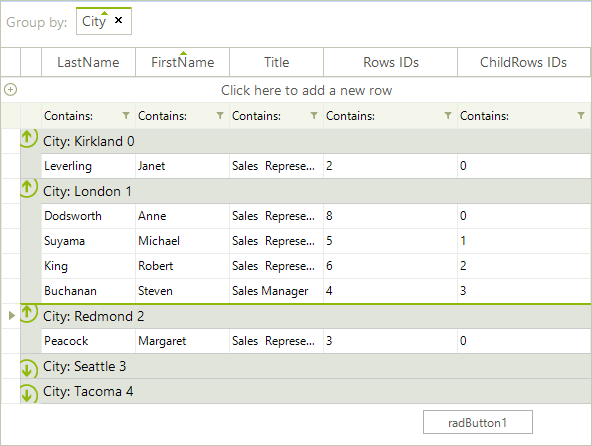 RadGridView will return only those rows which have the value 'Sales Representative' in their Title cells. When the filter data operation occurs, the FilterChanged event is fired, and in its event handler we refill our two columns with indices using the same method that we used before - SetIDs(). As you can see in the screenshot above, the indices of the rows do not match anymore. While the indices of the ChildRows column are still consequent numbers, the indices of the Rows column are not. 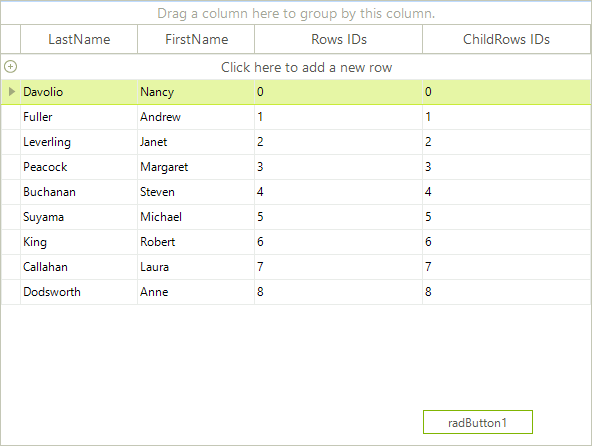 This is, because the ChildRows collection is based on what you get from RadGridView on the screen, while the Rows collection contains all the rows that RadGridView contains, but which may not be presented to the user, because of some data operation. The result is expected and follows the explanation in step 3. The rows in the ChildRows collection are only the rows that are displayed by RadGridView and are ordered in the order they are represented. On the other hand, the row instances and their order in the Rows collection is not changed. GridViewRowInfo.Index. 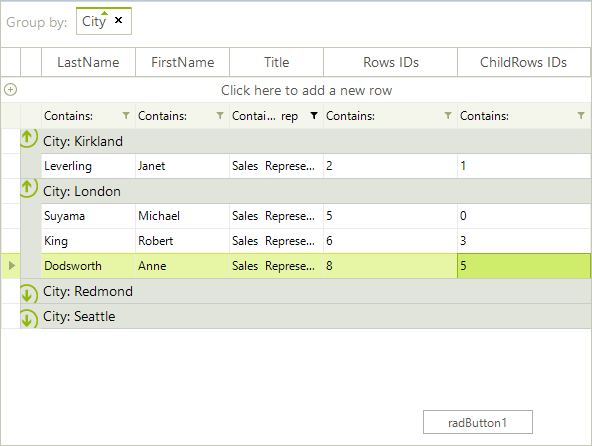 Data rows (GridViewDataRowInfo), group rows (GridViewGroupRowInfo), hierarchy rows (GridViewHierarchyRowInfo), all they derive from GridViewRowInfo, so they expose the Index property. CellElement.RowIndex. If you use our Formatting events to style the cells in RadGridView, you undoubtedly work with the CellElement that comes from the event arguments of these events. The CellElement exposes the RowIndex property which is a shortcut to CellElement.RowInfo.Index API.